It’s difficult to keep up with Moscow’s new restaurant openings, and based upon stats, the Italian chef recruitment business must be booming. L’Albero is just one of a number of post-crisis Italian newcomers on PASSPORT’s must-visit list. Opened by veteran restaurateur Andrey Zaitsev (Noa), l’Albero is ensconced in a grand old two-story building behind the fenced yard of an educational organization on quiet Delegatskaya, just north of the Garden Ring. The interior is light and open with huge windows, tables large and widely spaced, providing a very relaxed and quiet environment. Jean-Michel Brunie of Credit Suisse, Elena Fedko of Baker McKenzie Kiev, and Antoine Poissonier of Collection Privee joined John Ortega and me for dinner. We were fortunate to meet resident chef Nicola Canuti to discuss his work and recommendations. Canuti’s menu is “classic Italian with a new taste” according to the promotions. Canuti has worked in several Alain Ducasse restaurants including his Spoon restaurants in St. Tropez, Tunis and Mauritius. L’Albero has a selection of Canuti’s pasta, risotto, and meats creations and an ample selection of grill seafood that range in price from 290r per 100 grams for calmari to 900r for octopus. I started with an Octopus and Artichoke Salad (1550r), large sections of octopus presented on an artichoke puree with hazelnuts, delightful. The pleasing, fresh, bright green Minestrone (400r) was beautifully presented. The signature meat dish is a lamb filet, oven cooked slowly for 36 hours with fennel, oregano, cumin and sumac (1250r), which unfortunately was still in the oven. Nicola recommended the Osso Buco with Vegetables (1350r), which was perfectly cooked and served with a small silver spoon to lap up the centerpiece pureed marrow from the bone. The restaurant prides itself on its bakery, and not just the creative, fresh baked goods that started the meal; we topped off the meal with a selection of small sweets from the chef’s recipe book. 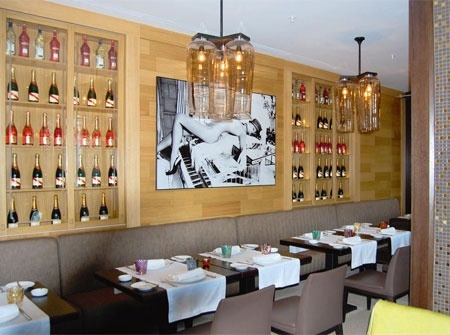 L’Albero is easily one of Moscow’s top Italian restaurants. Business lunches range from 750 to 1200 rubles. Cooking classes are the rage in Moscow now, and chef Canuti has joined in. Classes are 3500 rubles, but children can apparently join as well, free. Tatler Club, the newest trendy Novikov place on the first floor of the renovated and reopened Ukraine Hotel, reminds of its sister GQ by the Baltshug. It’s not really fair to review a restaurant the day after opening (in this case Tatler Club did not yet have an executive chef) but we wanted to give readers a heads-up on the first of the six or so restaurants that are planned for the Ukraine. The Ukraine appears to have been luxuriously updated, while retaining its heritage as one of Stalin’s Seven Sisters that include the Ministry of Foreign Affairs and Moscow State University. It’s worth a visit to see the 400 square meter diorama of Moscow’s center in the 50s. This award winning work, which was salvaged by the owners, toured Europe back in Soviet days, and has now been freshened up to stand at the back of the first floor. The Tatler menu is eclectic with pasta and sushi, but we focused on the significant Ukrainian section. Our selection included Stuffed Carp (740r), Draniki (potato pancakes) with Sour Cream (450r), Pelmini with Meat (480r), and House Jellied Meat (kholodets) with Mustard and Horseradish (610r). We added Baked Beet with Almonds and Goat Cheese (640r) and Terrine de Foie Gras with Fig Jam (970r). The Ukrainian selections were very fresh if stylish presentations of classics, pricy but such is expected on both Novikov and a hotel that is sure to move to the top of Moscow’s 5-star list. Steak is also big in Moscow, and the past two years has seen the opening of two decent steakhouse chains, Ti-Bon and Torro Grill, following on the success of Goodman, plus a few luxury meat joints. 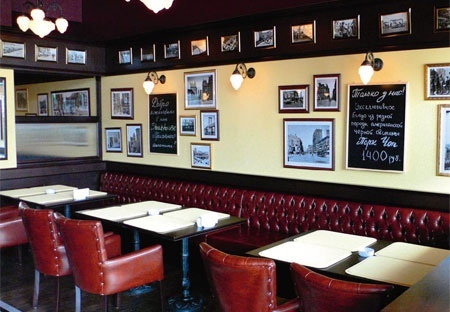 Veteran restaurant promoter Doug Steele has been involved in the recent opening of 21 Prime Steakhouse and Bar next to Barashka on Novy Arbat about 100 meters from the Garden Ring. 21 Prime’s menu and décor, heavy on deep, comfortable leather chairs and dark wood, are reminiscent of Steele’s Doug’s Steakhouse that quickly flamed out on Tsvetnoy Bulvar, though not because of the food. The walls are decorated with early 20th century black and white Americana photos. Steele’s signature is prominent across the entire menu: Cobb Salad, rows of fresh chopped meats and vegetables over lettuce with the classic dressing, and a Wedge Salad (395r), a large section carved out of an iceburg lettuce head served with ranch dressing. 21 Prime is using Steele’s Australian ranch suppliers for the beef. John Ortega ordered the 21 Prime T-Bone, an 18-ounce Angus with roasted tomatoes (1800r). Since this was lunch, I passed up the featured Ribeye Lite, a 9-ounce “bargain” and tried one of the bar menu items, Three Mini Filet Mignon Sandwiches with Mustard Mayonnaise (450r). These three small filets were perfectly tender, and the sauce a nice complement. The wine list was a big surprise, featuring very decent wines starting just over 1100 rubles. If this holds, this will be a Moscow innovation, which alone should make 21 Prime popular with Passport readers.